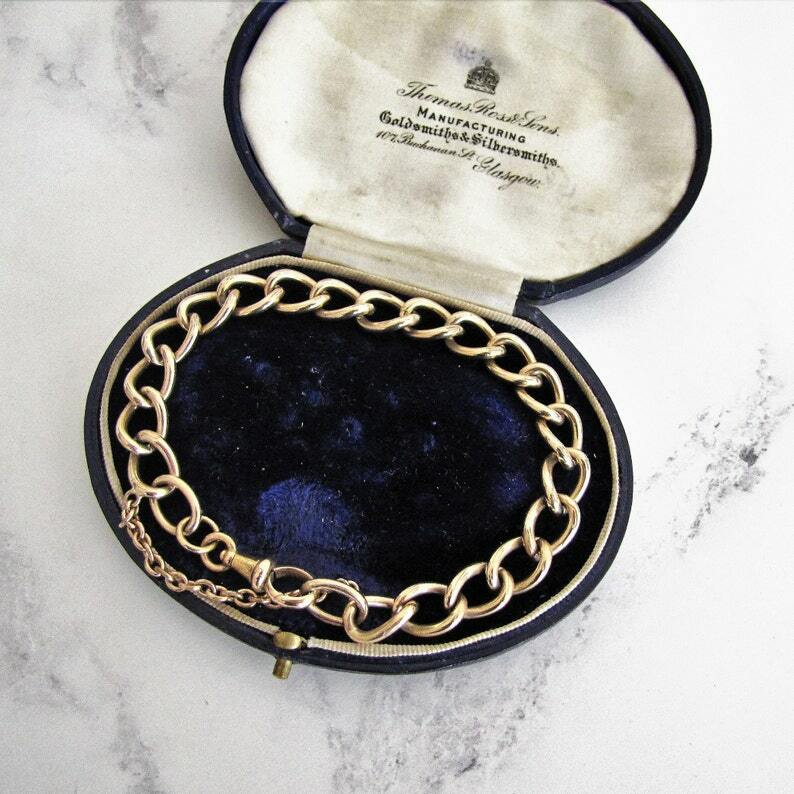 Sublime beautifully crafted Victorian 9 carat rolled gold chunky curb chain bracelet with a solid 9ct gold dog clip clasp. The links on this bracelet are solid, not hollow so it is a weighty and substantial piece. Looks and feels just like a solid gold antique bracelet and it is manufactured in exactly the same manner with soldered links and a safety chain. The bracelet consists of evenly sized curb links and boasts a very heavy gold overlay with no visible signs of wear so it even passed our initial inspection and acid testing! It features a heavy duty safety chain that is also rolled gold and a decorative dog clip that swivels and is solid 9 carat gold. A highly desirable English Victorian bracelet, great to add chunky charms, stack or wear alone and can be worn by a man or woman. Superb antique piece and well crafted! MATERIALS: 9ct rolled gold (gold fill) bracelet & safety chain. Solid 9ct Gold (tested) dog clip. HALLMARKS: Stamped 'RG' for rolled gold and makers mark 'EFC' on one of the oval end rings. The clip is not marked. CONDITION: Condition is superb with no wear to the gold layer and the clip strong and secure. The gold has the lovely rosy red hue of antique gold. Please note the antique box is for display purposes and is not included with purchase. Browse more exceptional fine and costume jewelry from every era - Georgian - Victorian - Edwardian - Art Deco - Modern - at mercymadge.etsy.com - With new arrivals added to our shop daily we offer an interest free layaway plan as well as a no risk guarantee. Our standard shipping includes tracking and signature confirmation for your peace of mind. Your purchase will arrive gift wrapped in a Mercy Madge box, perfect for giving or safekeeping!